I must admit that this recipe was actually a mistake - I had every intention of just making chili, not chili soup. However, in my opinion, you can rarely go wrong with good ingredients and this recipe is a testament to that! The result was more of a soup, but still so delicious and very nutritious! 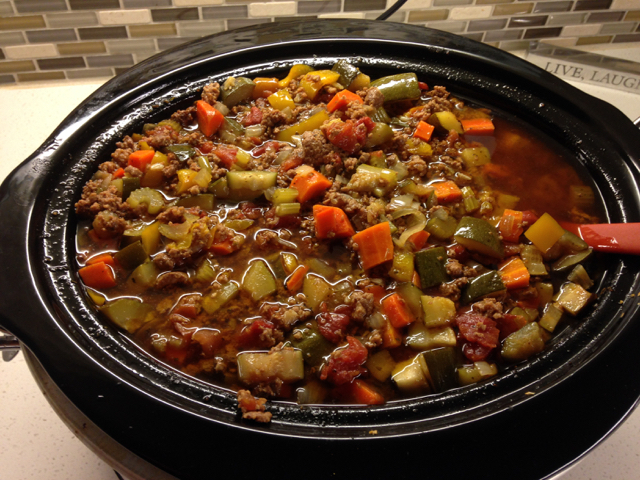 Not much better is better than some warm, hearty meat and vegetable soup! There is a lot of room for flexibility with the recipe too if you want to add more, less or different vegetables. And don't worry about the long list of ingredients, it's really just meat, chopped veggies, mixed with seasoning! **Drain excess fat if beef is NOT grass-fed. If it is grass-fed, draining depends on how greasy you like your food! I recommend draining about half the fat. I love this sauce! One of the few I've found that does not have added sugar!